For the busy readers of this blog who just want the purity of essence, here are the highlights in brief: (1) when touring Mendoza bodegas you need a driver and reservations; (2) the bodegas we visited in Lujan de Cuyo and Maipu made excellent wine, and (3) Valle de Uco is the must-see region. The photo is one view from Achaval Ferrer in Lujan de Cuyo. 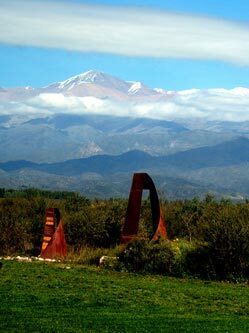 One of the highlights of any trip to Mendoza is touring the bodegas (wineries, schmendrick). This is not Napa, or Sonoma or Paso, or Bordeaux, or Piemonte, or Languedoc. It is most like Languedoc in that the bodegas are spread out few and far between. And everywhere there are vineyards. It is Argentina and has quite possibly the world’s finest growing conditions for producing great wines.